Future Work —Will Automation Impact Employment? Technology has always existed to make work easier, and to that end it has been incredibly successful. But what happens when work becomes so easy that the technology simply does it for us? It’s no secret that I have my own opinions about the prospect of artificial intelligence affecting our job market. That said, I do believe that the dialogue isn’t complete by any means. In his book Zero to One, Peter Thiel of PayPal and Palantir reminds us not to become spoiled by the idea that the future will happen, because, unless we actively design and implement that future, it won’t be the one that we get. Here in my state of North Carolina, there is a continuous discussion about employment and economy. Further, the entrepreneurial fire has grown hotter and larger over the past several years, triggering a period of job creation, especially in the digital and biological tech industries. With companies such as IBM with their Watson learning machine and Automated Insights content-writing robot Wordsmith based in the state, there is a sense of cognitive dissonance in the conversation. Are these companies actually taking jobs from humans by automating skills we rely on? Will we adapt quickly enough to feed people into the new workforce? Is our education infrastructure prepared to instill the next generation of workforce skills? The Institute for Emerging Issues at NC State is hosting the 31st Annual Emerging Issues Forum Februrary 8–9 2016. The event, named “FutureWork,” is themed around the above issues and will focus on helping communities and companies in North Carolina prepare for the impact of automation and intelligent machines. This is a perfect opportunity for leaders and workforce members to be involved in the greater discussion, present their concerns, and learn more about the systems already in place on both ends of journey. This forum will be the first in history to be televised live on UNC-TV, allowing even those that may not attend to take part. The forum, a two day affair, will begin at the Raleigh Convention Center for Day One on the 8th, and will relocate and continue at the Hunt Library at NC State on the 9th, Day Two. The first day will be geared toward exploring what North Carolina can do today to prepare by creating quality jobs for the upcoming future. This should be a perfect discussion for entrepreneurial leadership to take part in to inspire the creation of more leaders, and also to help direct their own actions towards innovating their own models to suit the changing market. The second day of FutureWork will involve hackathon sessions designed to help identify and dig into the obstacles presented by technological automation and the predicted market changes, and then create actionable plans and frameworks to address them. These hackathon sessions will be industry specific, and topics will feature the key sectors of Banking & Finance, Education, Energy, Healthcare, and Government/Smart Communities. 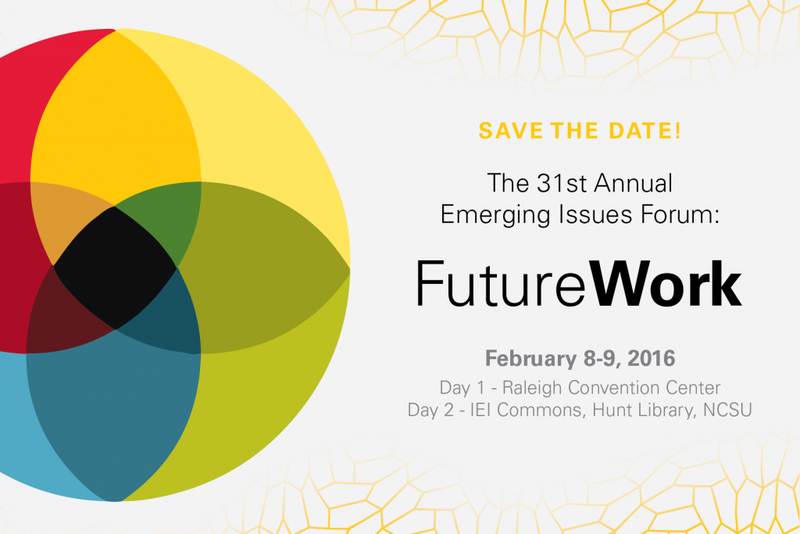 Speakers and appearances at FutureWork will include Governor Pat McCrory, Governor of North Carolina; Martin Ford, Silicon Valley Entrepreneur and Author of “Rise of the Robots”; Vivek Wadhwa, Nationally Syndicated Columnist; Dambisa Moyo, International Economist and Futurist; and Jaylen Bledsoe, Youth Entrepreneur and Tech Prodigy. Digital automation, robot manufacturers, machine learning, and electronic decision-making may have all been fantasies just decades ago, but they are now realities and are very present in our industries today. Many of these technologies are being pioneered right here in North Carolina. I personally doubt that jobs will ever deplete; as long as we have problems, there will be work to do. It is still a question, however, if we are producing the workers and leadership capable of identifying and solving these problems quickly enough to create and fill those jobs in the upcoming environment. FutureWork is a discussion that has already begun and has to be formally addressed, not just by thought leaders and experts, but by everyone touched by the economy. Again, the future will happen, with or without your permission, but only the future that we actively create today will manifest tomorrow. If we don’t replace fear with understanding and ideas with strategies, we will miss the chance to inject our vision into this upcoming paradigm shift and will have to adapt to the consequences rather than direct them. With that in mind, regardless of our employment scenario - now or in the future - we have at least one more job to do.